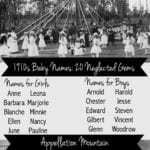 Let’s go back in time with 1890s Baby Names! This is the second installment in this series. 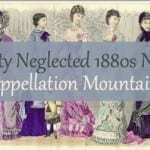 We talked about some of my favorite neglected gems from the 1880s in this post. And I must say, it was harder to choose twenty favorites – because there were so many 1880s names that remained in the US Top 100 a century later! But when I really looked at the list, I realized that there were still tons of names that were big in the 1890s that remain under the radar in 2016. If you’d like to compile your own list, the Social Security Administration lists the top names for the decade of the 1890s here. Ruth is a traditional, Biblical choice for a daughter. It’s brief and tailored, but undeniably feminine. That was a winning combination in the 1890s, when Ruth reached as high as #3. What explained the name’s rise into the US Top Ten? The 1891 birth of Baby Ruth Cleveland, daughter of President Grover Cleveland and his wife, First Lady Frances Cleveland. Her birth was a sensation, perhaps something like the recent arrival of Princess Charlotte. (Though, of course, without Twitter.) That makes it a must on any list of 1890s baby names. Pearl – Like Ruth, Pearl is a frills-free, yet feminine, choice for a daughter. It almost made my list of 1880s baby names, but Pearl was steadily popular, ranking in the US Top 30 for well over twenty years. Gemstone name Ruby is a current favorite, opening the door for vintage Pearl to make a comeback. Louise – We love Caroline and Elizabeth, but somehow the equally traditional Louise has been overlooked. Latinate Louisa re-entered the US Top 1000 in 2014, but Louise hasn’t charted since the 1990s. Back in the 1890s, it was a different story. Louise ranked between #30 and #50 throughout the decade. Irene – “Goodnight Irene” was recorded in 1933, but the name was popular for girls in the decades leading up to the song. Irene climbed steadily, from #60 in 1890 to #34 in 1899. 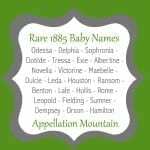 It would eventually spend a few years in the US Top 25, but I think it matches well with 1890s baby names like Ruth and Louise. Alma – Alma has an interesting story. It was sometimes – but only sometimes – used prior to the Crimean War. British and French soldiers defeated the Russians at the Battle of Alma, named for the nearby river. And so it became a sometimes-heard patriotic name. But that was the 1850s. What explains Alma’s rise to just above the Top 50 in the 1890s? It’s not clear. But in 2016, Alma works for yet another reason – it’s the Spanish word for soul. Marguerite – This is one of my favorite stands-out, fits-in names in 2016, a sister for Genevieve, an alternate to Madeleine. But I never realized it was so popular in the 1890s! The French form of Margaret reached #78 in 1897 – the name’s highest rank. It’s currently not even in the US Top 1000! Sallie – Love Molly and Sadie, but prefer something less popular? May I direct your attention to 1890s favorite Sallie? Like Sadie, Sallie started out as a short form of Sarah. It hasn’t been in the US Top 100 since 1900, though Sally – with a y – became a hit in the 1930s and remained popular through the 1950s. That’s probably why this name still feels more Baby Boomer than vintage antique. Gertrude – Stay with me for a minute! I know that Gertrude often appears on lists of names that will never make a comeback. But – don’t you love nickname Trudy? And doesn’t Trudy work well in our Ruby/Lucy age? As for Gertrude, it’s literary, saintly, and regal, too. 19 girls were given the name in 2014, up from 9 in 2009 – so maybe, just maybe, a few intrepid parents are rediscovering this vintage name. Hattie – When Tori Spelling named her daughter Hattie in 2011, I thought it signaled the name’s certain rise. Spelling is an on-trend namer – her other children are Liam, Stella, and Finn. Sure enough, the name re-entered the US Top 1000 the same year. But this nineteenth century favorite has yet to return to the Top 100, where it ranked throughout the 1880s and 90s. Hattie is originally short for Harriet, a feminine form of Henry. Harriet also remains in style limbo. Marion – Mary has fallen, and many of the Mary names are equally obscure in 2016. But tailored Marion deserves a second look, especially for parents drawn to equally elegant and restrained choices like Eleanor and Katherine. Originally a French diminutive for Marie, the name brings to mind Robin Hood’s Maid Marion and The Music Man’s Marian the Librarian. The -on spelling is used for boys as well as girls; Marian is almost exclusively feminine in English. Marion entered the US Top 100 in 1891, and would stay there through 1936. Earl – We’re all about King and Messiah these days, and Duke has seen some use. But somehow Earl feels more like somebody’s grandpa than a noble name meaning warrior. Earl reached #20 in 1894, and was a Top 100 pick through the 1950s. Today it’s fading, but feels like an interesting twist on bold names for boys. Ralph – I can’t decide about Ralph. It instantly brings to mind the little boy from A Christmas Story, which makes it seem adorable – but, since the movie was set in the 1940s, perhaps not quite ready for revival. Pronounce it Rafe – as in British actor Ralph Fiennes – and it seems instantly cooler and suave. (But perhaps an exercise in frustration, as it might be a tough pronunciation to stick.) And yet, just Ralph, rhymes with Alf, has a certain clunky-cool appeal. It hovered around the Top 30 mark beginning in the 1890s, and would remain in the 20s and 30s for decades. Elmer – Carter, Hunter, Asher, Ryder, Connor are all Top 100 choices today. Antique Arthur is enjoying a revival. So how ’bout Elmer? It makes the list of 1890s baby names because it was at its most popular in the decade, ranking in the US Top 40 consistently. Today’s it’s all Elmer Fudd and Elmer’s glue … but does it have to stay that way? 165 parents chose the name in 2014 – not enough to suggest a revival. But if you’re looking for a truly daring possibility with roots, Elmer is an option. Bonus? A built-in bedtime story. Francis – Is it fair to call Francis a neglected name in 2016? The popular Pope Francis has put it on the radar of many parents, and it seems like Francis names are on the rise. And yet, the name ranked just #478 as of 2014, which is far from common. So let’s say yes. Francis rose steadily in the decade, but has not yet returned to the US Top 100. 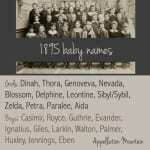 It’s definitely among the 1890s baby names that we could hear more often! Peter – I am a champion of Peter. From Saint Peter to Peter Pan to Peter, Paul, and Mary to the current Doctor Who, Peter Capaldi, it seems like a great, classic name for a son that remains steadily underused. During the 1890s, Peter hovered around the Top 50 mark – a place the name remained through the 1970s. If you’re after a classic that’s less popular than William, this is one of the 1890s baby names to consider. Frederick – Speaking of classics, Frederick has a lot in common with Alexander and Theodore. They’re big names – lots of syllables, lots of sounds. Frederick was in the US Top 100 from 1880 through the 1950s, meaning that it can be found on lots of family trees. It’s also a heroic Harry Potter name, and the source of Freddie, the adorable nickname name chosen by One Direction’s Louis Tomlinson for his new son. Frederick has fallen over the decades, and was barely inside the US Top 500 as of 2014 – meaning it’s not likely to be the next big thing anytime soon, and a safe bet for parents after an under-the-radar classic. Ray – Ray feels retro and modern at once. With boys answering to names like Jax and Dash, Ray is an obvious choice. 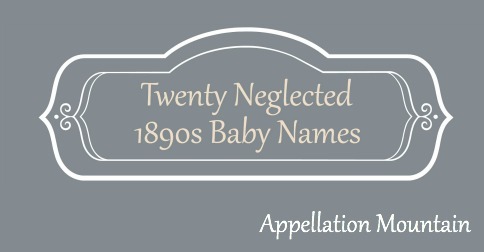 But the name has plenty of history, too, making it a possibility for parents interested in 1890s baby names. Ray brings to mind jazz great Charles, as well as celebrated author Bradbury. Rey is the Spanish word for king, and the name of the new Star Wars heroine. Otto – There’s something quirky-cool about Otto. Maybe it’s that great ‘o’ ending. Or maybe it’s that Otto is a palindrome. Either way, Otto has come full circle. A Top 100 choice in the 1890s but obscure by the 1970s, Otto has recently re-entered the US Top 1000. Tom – Thomas is traditional, and has never really gone out of style. But how ’bout just Tom? If you’re inclined to skip the formal name, Tom might be an interesting pick. Simple and straightforward, Tom brings to mind Tom Sawyer, as well as Cruise, Brady, Petty, Stoppard, Clancy, Brokaw, Ford, and … you get the idea. 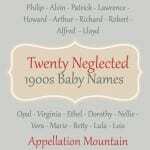 Are there any great 1890s baby names I’ve missed? Would you consider any of these for a child? And have I lost my mind with Gertrude? My two year old is Otto and we know three little Pearl’s. It was a great decade for namespiration. Namespiration = best portmanteau ever! Lol a lot of these names belong to my family. My mom is Gertrude Louise, her grandmother was Sallie. I have Aunt’s Pearl and Hattie their father my granddaddy was Henry. My step grandmother was Ruby. I don’t like Ralph though. Ralph is what kids in these parts call vomit. Is that association local? Love Ruth, Frederick, Otto and Tom (/Thom) especially. I’m sure I’ll be hearing more of these around by the time my 5-month-old daughter starts school. She already has friends called Ada, Alfred, Jocelyn, Audrey, Evelyn, Bonnie, Esther and Freddie! My children’s first names are Randolph and Frances, after my grandparents, although they both go by their middle names, Boone and Cypress. I’ve always been a fan of names from that era and I was delighted when my son’s 4-kids preschool all consisted of 2-3 year olds with “old-fashioned” names, too! Boone’s classmates are: Agnes, Audrey, and Ralph (swoon)! I think Ralph will be back when those who watched Wreck It Ralph as kids…are having kids. Pearl is a GREAT middle name option right now, so it’s got all the potential of becoming grand again. Ernest is a real temptation! It’s got the whole virtue vibe. I think the nickname of ‘Ernie’ is holding it back. I don’t understand why Otto doesn’t get more love., fantastic paladrome that it is. Thanks! My son has a friend named Ernest. He’s the third in his family going back four generations. (There were all girls in his mom’s generation.) And you might be right about Wreck-It Ralph – I can see my kids seeing it as a completely ordinary – and cool! – name. I love Gertrude! I’m a fan of girls’ names with lots of consonants so I’m out of step with our current vowel-heavy trendsetters. There are lots of names here I like: Ruth, Pearl, Marion, Ralph, Ray, and Otto. Oh Gertrude…I’m partially convinced that those of us (hello, Lisa) on team Gertrude all know one 😉 It’s a game changer. My great aunt was a *gorgeous* Gertrude in her day. The name seems so war-era stylish to me for that reason. She pronounced it Gehr-trude as opposed to Gur-trude and that’s my preferred pronunciation, though probably not the intuitive one. Great list! I love Ruth, Marguerite, Marion and Ray. But Ralph will always be a synonym for vomit for me so it’s a no-go, and Gertrude is as bad as Bertha or Hortense to my ears. Louise and Tom are both very popular in France at the moment. Gertrude is my beloved grandmother’s name. I would definitely use it for a middle if we have another girl. Frederick and Pearl are my favorites from this post. I love Gertrude and I love Ralph. My main association with Ralph is Ralph Moody from the Little Britches series.